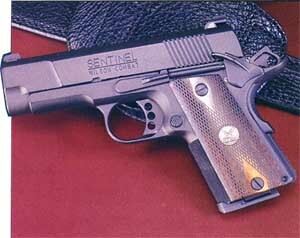 The Wilson Sentinel is a 1911-style pistol manufactured by Wilson Combat. The gun has a 3.6″ heavy barrel and is guaranteed by Wilson Combat to group 1.5″ at 25 yards. The Wilson Sentinel comes chambered in 9mm and ships with single-stack, eight-round magazines. The pistol weighs less than 32 ounces.